In this era of late capitalism, an alarming business trend is emerging, one in which corporations are allowed to privatize their profits while socializing their costs. Taxpayers bail out failed banks, only to see the bankers pay themselves huge bonuses. Mining, oil, and agro-biz companies feed at the trough of government subsidies and regulatory waivers. Big Pharma makes billions off patents derived from publicly funded research. And fast-food chains and big-box retailers leave it to public-assistance agencies to provide food stamps and healthcare to their low-wage, unbenefitted workforce. Crowdsourcing – the exploitation of Internet-based social networks to aggregate mass quantities of unpaid labor – is just one more method corporations have found to push their costs onto the public while retaining profits and property rights for themselves. Wikipedia, Facebook, and Kiva are all examples of how crowdsourcing has been used by corporations and nonprofits alike to supplant professional translation. Instead of hiring translators to render their web content into other languages, these enterprises simply invite their website users – mostly amateurs – to do the work for free. Exploiting free labor in this way is not just a worrisome new development in the history of corporate greed, but it actually makes strange bedfellows of capitalism and socialism, potentially leading to a new apartheid economics of socialism for the workers, capitalism for the bosses. In fact, there are ominous parallels between today’s slick techie platitudes for crowdsourcing and the dusty and discredited dialectics of Marxism. For starters, both ideologies hold a very dim view of professionals. In a communist society, where nobody has one exclusive sphere of activity, but each can become accomplished in any branch he wishes, society regulates the general production and thus makes it possible for me to do one thing today and another tomorrow; to hunt in the morning, fish in the afternoon, rear cattle in the evening, criticize after dinner, just as I have a mind, without ever becoming hunter, fisherman, shepherd, or critic. Such net-nerdy exaltation of amateurism has won its detractors. In their published critiques of crowdsourcing, technologists Andrew Keen and Jaron Lanier warn of a new Cult of the Amateur, or Digital Maoism. But the ideal of the noble amateur is no laughing matter. I believe it lies at the heart of Web 2.0’s cultural revolution and threatens to turn our intellectual traditions and institutions upside down. In one sense, it is a digitalized version of Rousseau’s noble savage, representing the triumph of innocence over experience, of romanticism over the commonsense wisdom of the Enlightenment. … [B]ad old ideas look confusingly fresh when they are packaged as technology… What we are witnessing today is the alarming rise of the fallacy of the infallible collective. Empowering the collective does not empower individuals – just the reverse is true….The actions of big institutions do matter, and it’s time to speak out against the collectivity fad that is upon us. In true Millenial mash-up style, the new zealots of crowdsourcing have playfully co-opted buzzwords from such disparate tracts as The Communist Manifesto and The Wealth of Nations. Marx’s plea for the proletariat to seize the means of production is reimagined by Howe as a “democratization of the tools of production”, while Adam Smith’s recipe for success is re-spun by Web 2.0 business authors like Yochai Benkler as The Wealth of Networks. Communities need a decider.…The most successful crowdsourcing projects use ‘benevolent dictators’ to guide the work of the crowd. But where Bushisms fall flat, Marx reminds us to reward collective altruism “from each according to his ability, to each according to his need.” Unfortunately, crowdsourcing makes no corresponding promise of benefit. Instead, it arrogantly assumes a mass donation of free labor under the new maxim, From each according to ability; to the corporation according to its needs. Over the past several years, people from around the world have begun exhibiting an almost totally unprecedented social behavior: they are coming together to perform tasks, usually for little or no money, that were once the sole province of employees. This phenomenon is sweeping through industries ranging from professional photography to journalism to the sciences … And now that model of production is rapidly migrating to fields far and wide. Other cheerleaders, like futurist Alvin Toffler, try to skirt around crowdsourcing’s inherent exploitation by insisting that in the new social media, producer and consumer are one; that, like a fish eating its tail, this new “prosumer” is both producing and consuming her own content. But where plaudits and prosumerism might be incentive enough for a close collaboration among a tight-knit group of enthusiasts, they are unlikely to be a sufficient motivator for sustained contributions on multiple projects over long periods. We do still live in a capitalist society, after all, and kudo-quenching prosumer pride just somehow falls short of making the rent, or putting food on the table, or repaying those pesky student loans that helped us acquire our skills in the first place. For those things, we need money. Crowdsourcing faces other challenges too. Projects that are difficult, esoteric, or boring – in other words, “work” – may not be all that appealing to large masses of people, and there is also a growing recognition that even on fun, relatively easy projects, the majority of amateur content is cow puckey. Most of the resulting submissions … will, to put it charitably, fail to meet a desired standard of quality… [R]eal talent will remain a rare commodity. As corporations grapple with these problems of sustaining motivation while ensuring quality, it would not be surprising to see a new Crowdsourcing+ emerge. The “plus” in the name signifies that the crowd being sourced is not one of altruistic prosumers, but of skilled specialists, working for a pittance. The “plus” accrues to the corporation. For the working professional, paid crowdsourcing is bound to be a total “minus”. Seen in this light, crowdsourcing is actually the finish line in the long Race to The Bottom that global Capital has been running for the last three decades. Early on, globalization displaced millions of blue-collar workers as factories were off-shored to countries with lower wages and less stringent environmental regulations. Crowdsourcing now threatens to displace millions of white collar professionals in global cyberspace. Witness the shuttering of newspapers, magazines, and foreign new bureaus, as free on-line media aggregators like Yahoo! and Google force professional journalists to turn to crowd-financed special-interest blogging for their livelihoods. Neighborhood booksellers are also going out of business, unable to compete against Amazon.com. And instead of paying professional designers and marketing firms, companies use web contests to crowdsource everything from new shoe designs to T-shirt logos to advertising campaigns. Encyclopaedia Britannica is under direct threat from Wikipedia, and the film and music industries suffer billions in lost revenue from digital piracy and file-sharing. By stealing away your eyeballs, the blogs and wikis are decimating the publishing, music, and news-gathering industries that created the original content those websites ‘aggregate.’ Our culture is essentially cannibalizing its young, destroying the very sources of the content they crave. Can that be the new business model of the twenty-first century? Already forced by clients to use computer-assisted translation tools and to conform to corporate glossaries, translators have lately been grappling with a ubiquitous Internet that makes us unable to compete with foreign-based peers charging a fraction of what U.S. living standards require. Translation itself is even a dying art, as more and more companies adopt machine translation, turning us into copy editors. And now, adding insult to injury, we are asked to accept that the future of our profession lies in machines doing half the work and amateur web surfers doing the rest. A desirable text is more than a collection of accurate references. It is also an expression of personality. The question isn’t just one of authentication and accountability […]. A voice should be sensed as a whole. You have to have a chance to sense personality for language to have its full meaning.… [W]riting professionally and well takes time and […] most authors need to be paid to take that time. Worst of all, crowdsourcing alienates white-collar professionals from their work in ways that resemble the alienation of manual laborers under Marx’s critique of the factory system. Not surprising, since crowdsourcing is, after all, little more than a widely distributed assembly line, its success dependent on the largest number of workers completing the smallest bite-sized modules of work, so that no single contribution risks undermining the integrity of the whole. In this way, crowdsourcing boxes in creativity, debases the humanity of the work, and separates the worker from the fruits of his labor, just as Marx observed at the dawn of industrial capitalism. 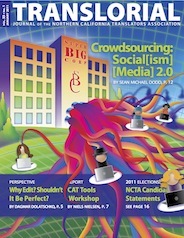 If the medium is the message, then what does the crowdsourcing medium tell us? That the sum of the parts is greater than the whole? That amateur zeal trumps professional expertise? That anonymity is preferred to authorship? That being a cog in the machine is better than building individual client relationships? That corporations should endlessly take from society, to keep for themselves? That labor should be free? Sean Dodd is a part-time Spanish translator-interpreter based in Napa, California. Barbara Guggemos posted this article under Essays	on Saturday, January 1st, 2011 at 12:11 pm	You can follow any responses to this entry through the RSS 2.0 feed. Both comments and pings are currently closed.